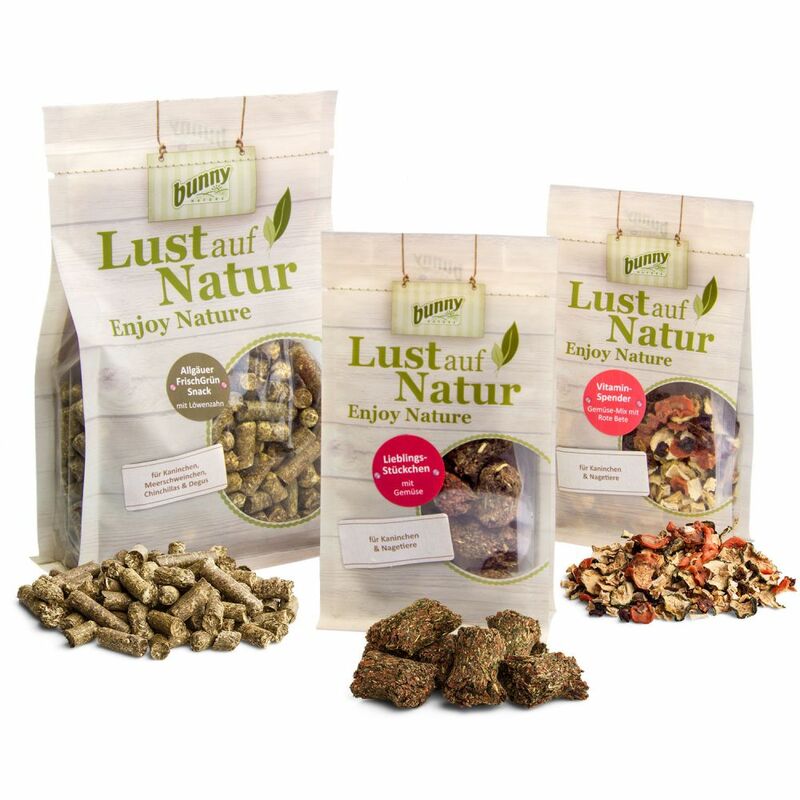 The Bunny Enjoy Nature Snack Set is a diverse snack mix for your small pet. Rabbits, guinea pigs, chinchillas and degus will all enjoy these healthy, natural snacks. Each of the 3 varieties included in this set follows the Bunny philosophy of nourishing your small pet in the way that nature intended. The crackers, pellets and vegetable flakes are all sugar and additive-free, and do not include any flavour enhancers, preservatives or colourings. These three different varieties will ensure your small pet has lots of tasty, healthy treats to nibble: Vitamin Pack Mix: this veggie mix with red beets is full of vitamins. With beetroot for an extra boost of Vitamin B. FreshGreen Snack with Dandelion: with 16 different types of green plant and graΒ. High fibre with a coarse structure. Particularly suited to animals with hay allergies. Favourite Pieces with Veggies: This crunchy and crisp snack is free from any sugary pastes. It's ideal for nibbling and full of eΒential nutrients. Bunny Enjoy Nature Snack Veggie at a glance: 3 varieties of supplementary food for small pets, such as rabbits, guinea pigs, chinchillas or degus Healthy recipe: A mix of vegetables and graΒes to provide your small pet with eΒential nutrients, and a species appropriate diet 100% natural: no colourings, preservatives or flavour enhancers. No artificial additives No GM ingredients Grain and sugar free Three different varieties: Vitamin Pack Mix (50 g): veggie mix with beetroot for an extra boost of Vitamin B FreshGreen Snack with Dandelion (450 g): with 16 different types of green plant and graΒ. High fibre with a coarse structure. Particularly suited to animals with hay allergies Favourite Pieces with Veggies (65 g): crunchy and crisp crackers ideal for nibbling and full of eΒential nutrients. Recommended by vets: Bunny is a family company that produces species-appropriate and natural small pet foods. Their products are highly recommended by experts.